As a swimming pool owner, nothing is more important than the safety of the people enjoying your backyard. That’s why you want rules in place to help keep every adult and child at your home safe in and around the pool and patio area.Clear guidelines for pool and backyard behavior and activity are critical. Setting and communicating expectations for what conduct is and is not acceptable can go a long way to promoting safety. Toward this goal, here is a helpful list of safety rules for anyone using your pool and patio area. A copy of these rules is also provided below as a handy two-page, printable flier; you can even customize it for your pool! Effectively sharing the pool safety rules with your family. Educate your loved ones about this important information. Think about communicating the rules in both written and verbal forms. Sharing the rules directly—in person—with each family member is imperative. Hold a family meeting out by the pool. Print and give a copy to everyone who is old enough to read. Then, take turns reading each rule out loud, one by one. 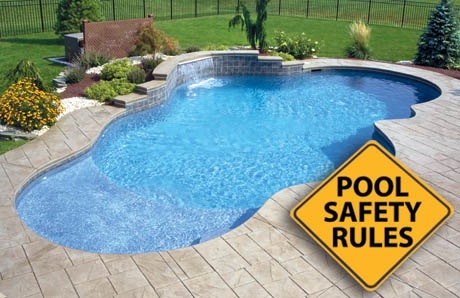 Explain that the purpose of the rules is to help everyone safely enjoy the pool and patio area. Take the time to discuss the reason behind each one. To drive home the importance, consider asking family members to think of examples of the kind of accidents and injuries that they could imagine occurring if a rule is not followed. Then, ask them to share these examples. After all, the better family members understand the rules and can appreciate their value, the more likely they are to follow them. Take special steps to inform pool-party guests about the guidelines. Planning a pool party? Maybe your kids are having a few friends over for a dip? Boost the odds for a smooth, fuss-free event: Go the extra mile to inform each guest of the safety rules. One way is to email these rules in advance to those you know will be coming to use your pool. This way, guests have the opportunity to review the information ahead of time. Note: For a pool party where guests will be bringing young children, you will also need to a set schedule and plan for continual adult supervision that is strictly followed throughout the entire event. There is no substitute for adult supervision. Another method to promote the rules is to hand them out in person. Print copies, and distribute one to each guest as they arrive at your home. Even if you already sent an email, not everyone will have read it. Ask each guest if they have, and nicely insist that they go through the rules now if they have not already. If they are bringing children, check that they have reviewed the rules with them. However you choose to circulate this information, make sure that adults and any children understand how to behave when they are out at your pool and patio. • Be sure you can swim—or have help in the water. Enter the pool only if you know how to properly swim, have an experienced swimmer to assist you, or have a flotation device such as a life vest, arm floats, or air cushion. • Swim with someone else. Make sure another swimmer is either with you in the pool or is there supervising whenever you are in the water. • Drink water to stay hydrated. Be sure to drink plenty of water—never from the pool—to keep yourself hydrated throughout the day—especially if it’s warm outside. Be considerate of others: Use the bathroom before you go into the pool—and leave the water if you need to take care of business. Use the diving board. Be sure to dive only from the front of the board—never from the sides. If you go off the sides, you can hit the pool edges and get seriously hurt! • Use the pool slide the right way. Go down the slide only one way: with your feet first. You can be severely injured by going down the slide head first! Also, only one person at a time on the slide—including the ladder. Before taking your turn, check the landing spot in the water below to make sure it’s clear. You don’t want to land on someone else. • Dry off before entering indoors. When exiting the water to go inside the home, be sure to completely dry yourself off before entering. Take care to not track water onto slick floors where someone could slip. • Take extra caution when using a heated spa. Staying in hot water for too long can cause nausea, dizziness, vomiting, overheating, or burning of the skin. Depending on the spa temperature, limit soaks to 30 minutes. Keep children under 5 from spa use. Drink lots of water— never alcohol! If you take certain medications or have heart disease, diabetes, or high or low blood pressure consult with your doctor before taking in a hot soak. • Don’t dive into shallow water. Never do a dive into water that’s less than eight feet deep. Never dive off the sides of the pool. Dive only off the diving board. • Don’t run around the pool deck. Running around the pool area is dangerous. If you trip and fall on the deck or into the pool, you can hurt yourself badly. • Don’t allow dogs in the pool without supervision. Not all dogs know how to properly swim; some do, but can easily tire out. Make sure to keep an eye on your pets when they are in the water. • Don’t engage in rowdy horseplay in the pool. Steer clear of playing rough games involving dunking, holding your breath for any extended period, or lifting and throwing others into the air. • Don’t use glass containers. Beverage glasses can easily break on the pool deck or pool walls. Instead use outdoor-friendly options like acrylic tumblers or paper, plastic, or foam cups, or drink from a can. • Don’t enter the pool under the influence of alcohol or medications. Swimming under the influence poses risks: Alcohol and some medications can impair your ability to swim and affect other motor skills, as well as breathing and orientation. • Don’t push anyone into the pool. What seems like fun can be dangerous. You could severely injure someone when you suddenly throw, push, or yank them into the water when they don’t expect it. • Don’t heavily splash the water. Try to keep as much water as possible in the pool. Don’t engage in water fights or splash others when they are outside the pool on the deck. Here are two choices of formats that you can edit the flier and delete rules that do not apply (e.g., you have no pets, your pool has no spa, diving board, and/or slide). Pool_Safety_Rules_-_Flier - EDITABLE WORD DOC.